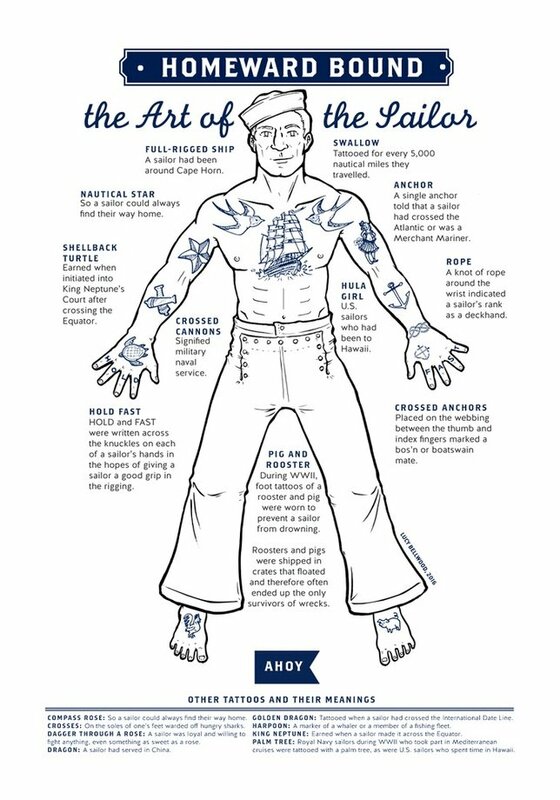 Old school maritime tattoos were born out the lives and adventures of sailors; and so does the pig and rooster tattoo! According to seafaring traditions they would keep a sailor from drowning. A lucky charm of sorts. A plausible explanation is that pigs and chickens were often carried on deck in wooden pens as they were easier to keep and a valuable source of food. In a shipwreck the pens, being of light wood, would often wash ashore. Pigs and chickens were at times the only survivors of ship wrecks, and perhaps it was the sailors who were fortunate enough to survive a shipwreck or a near drowning would get the tattoo as a symbol. At further thought, having a pig and rooster tattoo would guarantee that a sailor eats well. There are swimming pigs through-out numerous islands and cays. The infamous Paradise Island was until recently Hog Island with an adjacent Rooster’s Cay (supposedly still owned by Eddie Murphy), and there is even an Egg Island, Eleuthera, The Bahamas. With the history of Egg Island dating back to the first settlers to The Bahamas, the island's name supposedly comes from it formerly being home to a population of wild chickens put there by sailors who wanted a source of fresh eggs while at sea. Now the island is home to a population of wild goats which are occasionally shot for food. The goats have evidently eaten all the eggs, though, because the chicken population is nowhere to be found. Big Major Cay is uninhabited and the pigs are not native to the island. Some say they were left by (or escaped from) a group of sailors, who planned to come back and cook them. Or that the pigs swam over from a shipwreck nearby. Wherever they came from, there are now about 20 pigs and piglets on Pig Beach. With daily visits from Bahamians and tourists, the pigs are living the easy life on Big Major Cay. There are other islands throughout The Bahamas to see these infamous swimming pigs. 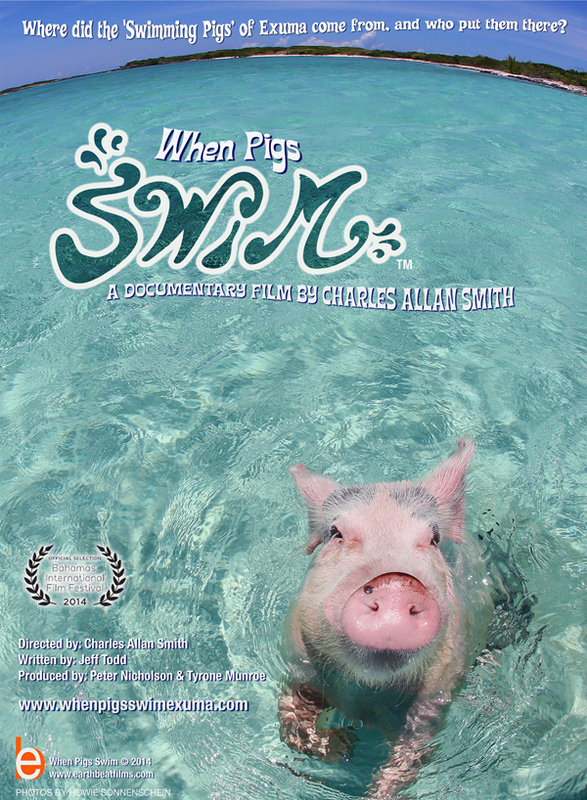 In 2014, Charles Allan Smith filmed a documentary named “When Pigs Swim”. This is arguably, what propelled the pigs into the world-wide spotlight. The rest is history as they now have been featured in Expedia commercials internationally, several documentaries and just about every traveler’s bucket list; tourist have found the pigs not only in Exuma but in Abaco, Long Island, and Eleuthera. In October 2018, T.R. Todd with Skyhorse Publishing published Pigs of Paradise: The Story of the World-Famous Swimming Pigs. Yacht Sweet Escape has a variety of itineraries that will be able to visit the SWIMMING PIGS of The Bahamas, wether that be Exuma or further a field. They are a sight to behold with their mysterious swimming talents, as they enjoy the salt-life of the beautiful Bahamas.